What will the weather be like on your vacation? 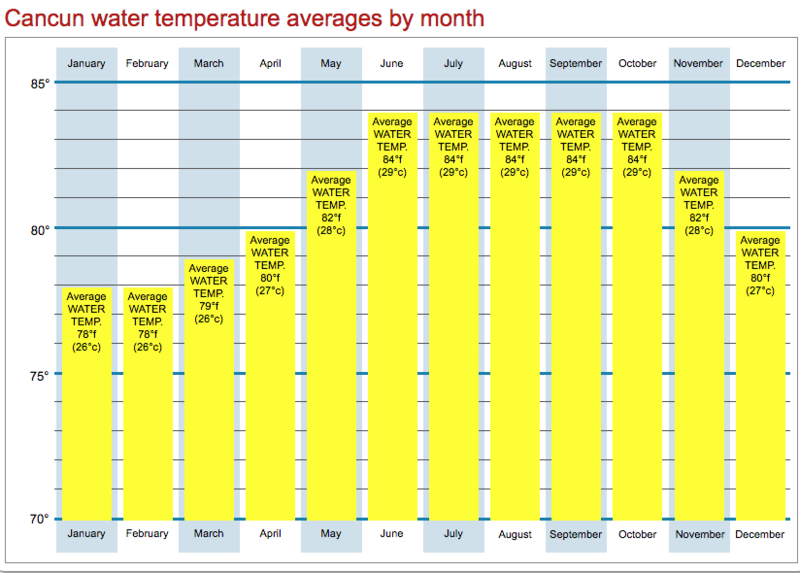 No one can really answer what the weather will be like for sure, but we can give you some ideas based on averages. 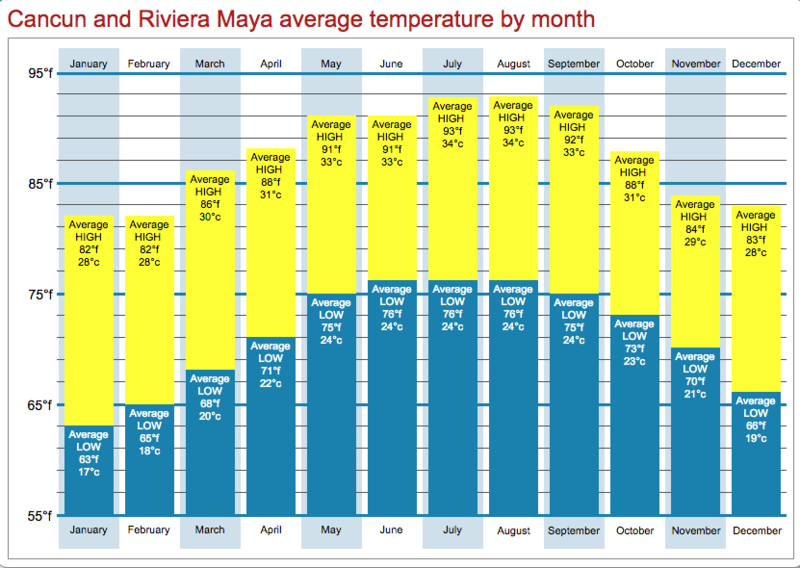 During sprintime months, the sun’s angle in relation to the earth begins to shift and the heat energy hits the Cancun area at a more direct angle; average temperatures increase, reaching about 91° fahrenheit (33° celsius) in May. In July and August,average temperatures reach their peak of 93° farenheit (34° celsius). As the sun angle shifts back toward the southern hemisphere, temperatures drop, with major drop in October and November after the sun has passed into the southern hemisphere. Nearly constant ocean temperatures help to moderate air temperatures to within about 10° (6° celsius) throughout the year. Nights from December to March can feel a bit chilly due to the ocean breeze. From December to February, you may see a few showers in the late afternoon.. The average 2 inches (5 centimeters) of rain that falls typically will not cause a problem for vacationers. Rainfall is typically even more scarce during March and April, with an average of only 1 inch (2.5 centimeters) during each month. May sees rainfalls increase, but showers typically take place later afternoon or night. Expect to see about 3 inches (7.5 centimeters) of total rain during May. June is the beginning of the rainy season, with as much as 6 inches (15 centimeters) of rainfall. Travel in June and you could have a rainy day that keeps you off the beach. July through November are consistently between 4 to 5 inches (10 to 12.5 centimeters) of rainfall each month, but often that can take place during one week. 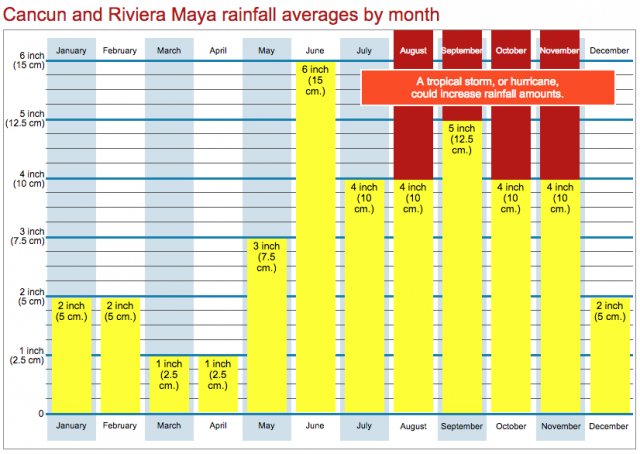 Your chances of a wash-out vacation increase during this period. Tropical storms, or even the occasional hurricane, can ruin a vacation. Cancun and the Riviera Maya are located along a stretch of current that pulls warm water from the equator, up the coastline, then into the Gulf of Mexico. These waters cool along the way, but the water temperatures never drop below 78° farenheit (26° celsius) druing winter months. During summer months, when the sun is more directly over Cancun, the water temperature rises to 84°—we love to visit during this time, the ocean feels like bathwater. These warm water temperatures are also what fuels hurricanes. In fact, hurricanes play an important role in nature. They draw heat from the ocean and spin it off into the atmosphere, helping to regulate water temperatures and protect marine life cannot thrive in hotter temperatures. The sunset times shown below are approximate, so head for the beach a few minutes early to make sure you get the perfect shot. Great sunrise shots can be found from most east-shore beaches, and sunset photos can be taken across the Nichupte lagoon with the mangrove jungle in the background. In these areas, you’ll have to settle for sunrise shots only, sunset views are blocked by the cities and trees (unless you can get to the roof of a taller building). This small island offers excellent opportunities for both sunrise and sunset photos. At sunrise, head for the south point of the island—which is also the easternmost point in Mexico—and be the first in that country to watch the sun break over the horizon. In evenings, the sun makes a dramatic departure best photographed from the west corner of North Beach. This island offers excellent sunrise and sunset photos, however it is a larger island and sunrise is only seen from the eastern shore, far away from most hotels. Sunsets take place right off the beach and provide a beautiful display over the open ocean. Most northern cities like New York, Chicago, London, and Berlin, enjoy extremely long summer days. June 21—the longest day of the year—offers over 15 hours of daylight in most of these cities. Due to their location near the equator, Cancun and the Riviera Maya do not enjoy such long days. 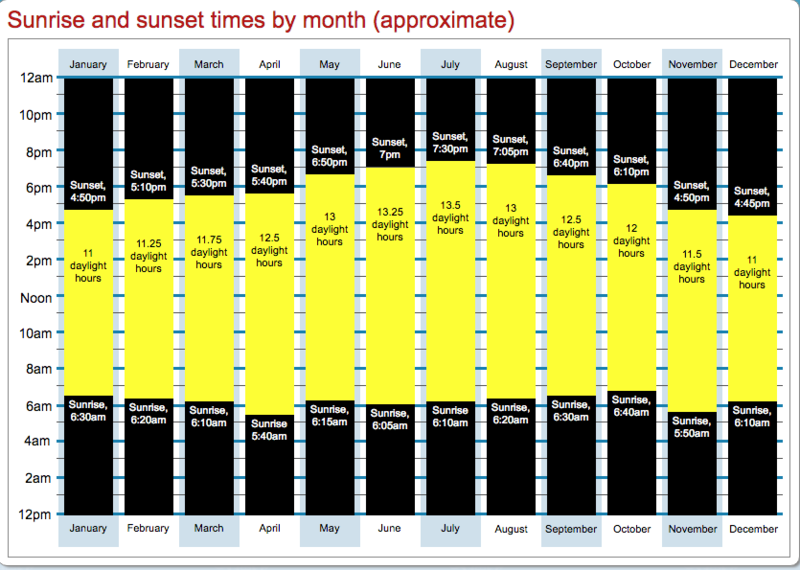 In fact, June offers nearly 2 hours less daylight time. Factor in that most tourists sleep in mornings and you may only enjoy about 9 hours in the sun (probably a good thing in the heat of the sun). Luckily, there are plenty of things to do after the sun goes down. From December to February, Cancun and the Riviera Maya only offer about 11 hours of daylight. If you sleep in until 10am, you’ll only enjoy about 6 hours of sunshine each day.